The twin findings further prospects for one day discovering evidence of life on the Red Planet. NASA announced on Thursday two discoveries which further the prospects that scientists might one day find evidence of life on Mars. 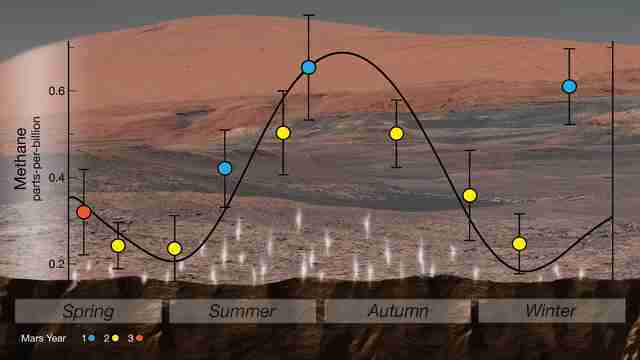 First, data from NASA’s Curiosity rover has shown for the first time that methane levels in the martian atmosphere have a seasonal cycle. Scientists analyzed three years of atmospheric measurements taken by Curiosity and found low, background levels of methane that rose during summer in the northern hemisphere. Also, scientists detected organic material preserved in rocks in Gale Crater, which is thought to be an ancient lakebed. The find suggests the planet could have supported ancient life. Chris Webster of NASA’s Jet Propulsion Laboratory said the methane discovery showed a discernible pattern in seasonal concentrations of the gas. The methane could come from a biological source, but is likely stored in crystals called clathrates, which release the methane into the atmosphere during warmer summer weather. NASA/JPL-Caltech | Curiosity has detected seasonal changes in methane at Gale Crater using its SAM instrument. Scientists first detected methane on Mars in 1999. Then, in 2014, Curiosity detected methane spikes, but the fluctuation in methane levels didn’t appear to fit a pattern. Webber told Seeker the latest announcement is different than past methane discoveries. The methane concentrations ranged from 0.24 to 0.65 parts per billion. 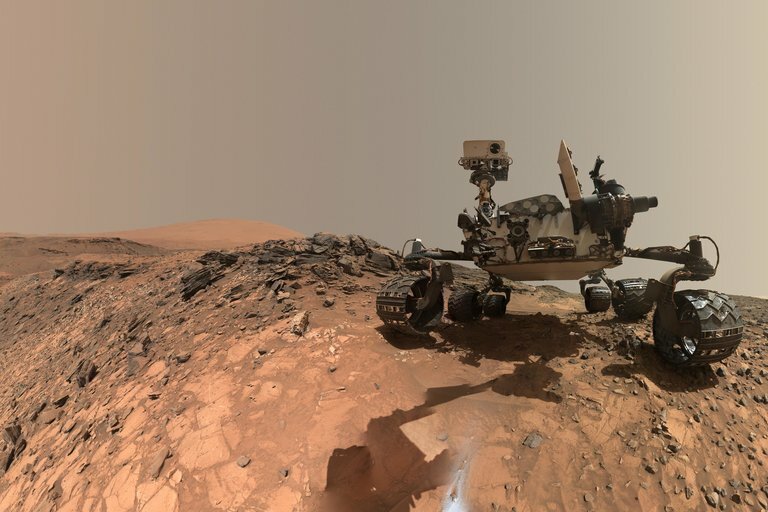 The organic material detected by Curiosity, according to Jen Eigenbrode of NASA’s Goddard Space Flight Center, had been preserved in martian rocks for over 3 billion years. Though the molecules are organic, the find doesn’t confirm the existence of life on Mars. The source of the organic material could have a meteorite crashing into the Red Planet, for example. 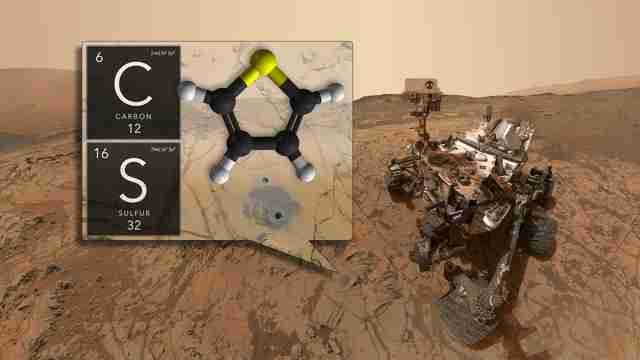 NASA's Goddard Space Flight Center | Curiosity has discovered ancient organic molecules in Gale Crater. Eigenbrode said the molecules are amazingly robust. They were found close to the surface and were exposed to ionizing radiation, which can degrade organics. A drill on the Curiosity rover made a 5 centimeter hole in mudstones in Gale Crater at sites called Mojave and Confidence Hills. The rover then heated the rock samples to over 900 degrees Fahrenheit (500 degrees Celsius) and analyzed the molecules that were released. The process revealed the presence of several organic molecules, including carbon, thiophenes, benzene, toluene, and small carbon chains, such as propane or butene. Like the methane discovery, NASA had also announced in 2014 the detection of organic molecules. Curiosity found new organic layers just four miles away from the first site. And Eigenbrode said the new find provides another boost for research on the Red Planet.